Reinventing American Health Care - Audiobook | Listen Instantly! In March 2010, the Affordable Care Act was signed into law. It was the most extensive reform of America's health care system since at least the creation of Medicare in 1965, and maybe ever. The ACA was controversial and highly political, and the law faced legal challenges reaching all the way to the Supreme Court; it even precipitated a government shutdown. 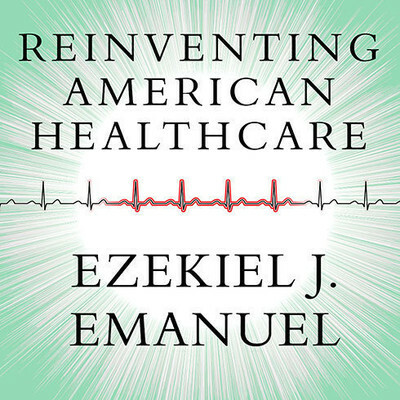 Ezekiel J. Emanuel, a professor of medical ethics and health policy at the University of Pennsylvania who also served as a special adviser to the White House on health care reform, has written a brilliant diagnostic explanation of why health care in America has become such a divisive social issue, how money and medicine have their own American story, and why reform has bedeviled presidents of the left and right for more than one hundred years. Emanuel also explains exactly how the ACA reforms are reshaping the health care system now. He forecasts the future, identifying six mega trends in health that will determine the market for health care to 2020 and beyond. His predictions are bold, provocative, and uniquely well-informed. Health care has never had a more comprehensive or authoritative interpreter. Download and start listening now! Ezekiel Emanuel is the son of Benjamin Emanuel and Marsha Emanuel and the brother of Chicago mayor and former White House chief of staff Rahm Emanuel and Hollywood talent agent Ari Emanuel. A vice provost and university professor at the University of Pennsylvania and a member of the Institute of Medicine of the National Academy of Sciences, Emanuel also served as the special advisor for health policy to President Obama’s director of the Office of Management and Budget. He is an op-ed columnist for the New York Times. Raised in Chicago, he now lives in Washington, DC, and Philadelphia.